Hill's Prescription Diet n/d Canine is a complete and balanced food that provides all the nutrition dogs need. It is recommended for nutritional support for dogs with cancer and recovery including anorexia, debility and surgical convalescence. Reduced carbohydrate - helps limit lactate production in tumour bearing dogs. Increased fat - energy source for patients, which tumours cannot redaily utilise. Increased protein - helps meet increased protein requirements of the cancer patient. 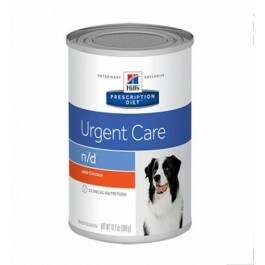 High omega-3 fatty acid - helps maintain dogs in remission. High arginine - aids immunity. Beef, pork liver, ground rice, fish oil, chicken, digest, iron oxide, dried beet pulp, cellulose, potassium citrate, calcium carbonate, L-arginine, dicalcium phosphate, taurine, vitamins and trace elements. 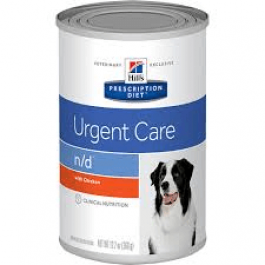 Hill's Prescription Diet n/d Canine should be recommended by your veterinary surgeon. For detailed information on feeding amounts and how this food can help your pet, please consult your veterinary surgeon. Exclusively feed the recommended Prescription Diet food and keep fresh water available at all times. Please note that this is a guide only and that individual animals may have different requirements. Adjust the feeding amount to maintain the optimal body weight. Hill's Prescription Diet n/d Canine has a high fat and energy content; therefore it is recommended that the full feeding amount is introduced gradually over 4 - 5 days to minimise the possibility of a temporary gastrointestinal upset.